Integral Marketing Mobile, Banner advertising network details. Integral Marketing has been in the business for almost 10 years now and with six years of advertising experience, their understanding of working with different technologies has reached new limits. Integral Marketing uses a high-end targeting technology in order to maximize revenue for various brands. If you are a website owner, you have multiple options and features to use in order to increase your earnings and get more traffic. This platform provides efficiency in costs and long-term partnerships with popular brands in order to attract various audiences. 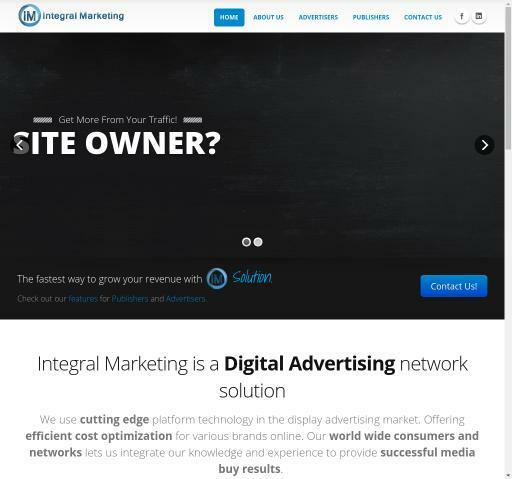 If you want to join the Integral Marketing Network, click on - Join Now! For additional information before registering on the Integral Marketing platform, see the Information section to find out what Pricing Models they offer, which are their Targeting Options and Advertising Formats. Don’t forget to return on Affbank in order to leave a review about Integral Marketing.